Basics for feeling good: This black spaghetti top from the popular SCHIESSER line "95/5" is a perfect undershirt with great wearing comfort! 95% silky-soft cotton and 5% elastane do not only promise a wonderfully soft feeling on the skin, but are also especially practical in combination with the adjustable straps. 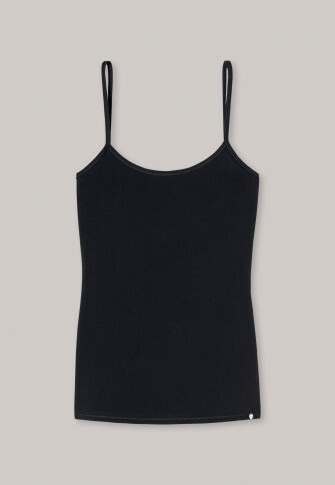 A comfortable, well fitting top for women, who prefer not to wear anything but the best SCHIESSER quality on their skin! Schönes Top , perfekter Sitz ,angenehmes Material. Ich hatte das gleiche Produkt schon einmal bestellt, war zufrieden und habe es deshalb wieder bestellt.